The race is on to see which railroad company can lay tracks through Apache Pass first. In the old west, that means trouble! The railroads have to keep gunslingers on the payroll to protect their turf from the competition. Asa Blaine of South & West Railroad has Chet Manning on his payroll. Chet is Asa's chief troubleshooter and he has a fearsome reputation as such. He's all hard edges and lethal with a gun. He's also got a soft spot for women, when he can find the time. Asa and his wife Polly are like family to Chet, but he's never been close to the Blaines' son Willard. Willard is nothing like his father and he has no desire to follow in his father's footsteps. Netta is the famly's orphaned niece. Netta is a comely young woman who attracts both Chet and Willard, both of whom should be keeping their distance for different reasons. Ben Yaro works for Pacific Railroad. Ben is an ex-lawman turned unscrupulous killer who is out to stop S&W from laying their tracks by robbing, killing and destroying. Trying to keep one step ahead of Yaro is not easy, especially since there is a traitor in their midst! It's wiinner takes all, with lives hanging in the balance, and if Chet can't stop him no one can! I liked this gritty, quick shoot-'em up of a western. I really need to read westerns more often and I look forward to reading more about Chet Manning. It looks like there are more books in the series but I haven't yet determined what order or how many. 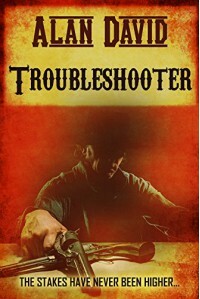 I want to thank the publisher (Pioneering Press) for providing me with the ARC through Netgalley for an honest review. Alan David is a pseudonym of Donald S Rowland, a prolific writer of over 500 novels in various genres. His other titles include Murder Range, Die Hard, Stalingrad Heroes, Heroes without Honour,Heroes in Normandy, The Battle Done and Both Feet in Hell. Pioneering Press is an imprint of Endeavour Press, the UK’s leading independent digital publisher. We publish new and classic westerns by authors from the US and the UK.